Do you need to upgrade your style in the kitchen, or want to look like an Executive Chef? 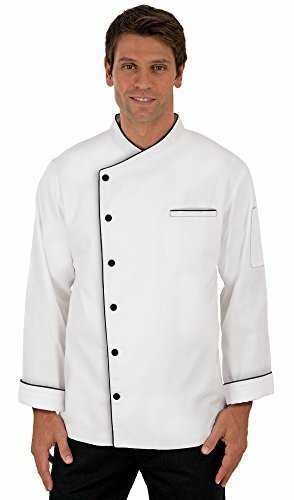 This Traditional Fit Folded Cuff Men's Chef Coat with Piping and Fabric Buttons is the perfect choice for you no matter what industry you're in or the need for this chef apparel. This coat is well-made and gives you the best value at a competitively lower price, easily bundling comfort, quality and value, all in one. Made of a 65% polyester 35% cotton fine line twill fabric blend, this is a chef jacket you'll love! This coat includes a European crossover collar for a clean look, folded cuff long sleeves for extra protection in any kitchen, fabric/cloth covered buttons for ready to take on all the action your shift or event brings, a chest and thermometer sleeve pockets for functionality and storage, and is traditionally fit for easy wearing. As a bonus, this coat has contrast piping to create a look that doesn't get any more professional than this chef coat. To help complete the look of this chef wear or uniform, this coat is available in 3 colors to coordinate with any attire or match any standardized uniform requirement. For sizing, please refer to the additional product images that contain our size chart and measuring instructions to help determine your best fit. TRADITIONAL FIT: This chef coat is men/unisex styled and fitted for durability and comfort ensuring this coat works as hard as you do without the hassle. This coat features long sleeves, cloth covered buttons for simplicity, a chest and thermometer sleeve pockets, and a classic cut for easy fitting and easy wear. EXECUTIVE ACCENTS: With a European crossover collar and contrast piping at an incredible value, this chef jacket was made with food service professionals in mind. Not only does this coat easily coordinate with any attire or match any standardized uniform requirement, these extra touches of styling help create a look that doesn't get any more professional than this. EXCELLENT VALUE: This Men's Chef Coat with Piping and Fabric Buttons is comfort, quality and value, all bundled in one. Chefs, Line Cooks, Caterers, Counter Servers, Expediters, Directors, Managers, Students, Bakers, and much more; all find this coat affordably priced and available in a wide range of sizes perfect for all food industry professionals. Click 'Add to Cart' now to join the list of satisfied buyers!